How is a prescribed burn controlled? Having a burn plan is critical to controlling a fire and ensuring that you safely accomplish your goals and objectives. This plan contains all the information the fire manager needs to know about the burn unit: the landowner’s objectives, locations and types of burn breaks, fuel types present, desired weather conditions, required crew and equipment, presence of hazards, neighbor and emergency contacts, permits, contingencies, and the plan for actually conducting the burn. If you are part of a state or federal cost-share program, you will need a burn plan to receive approval and/or credit for completing the practice. A fire manager will invariably begin a prescribed fire at the farthest spot downwind. If the wind is from the west, for example, the fire will be lit at the farthest eastern point of the property. A backing fire moving from the right into the wind coming from the left. Note the short flames. Based on his or her knowledge of the topography, fuels, and weather conditions, the manager will then use three types of fire to start, control, and complete the prescribed burn: backing fire, flanking fire, and head fire. Backing fire is a line of fire perpendicular to the wind direction, backing into the wind. Because they are forced to move into the wind, backing fires have relatively short flames and slow rates of spread. A fire manager will almost always start a prescribed burn with a backing fire. Backing fires burn fuels for a longer duration and at higher temperatures at the ground surface than the other two types of fire. Although their flames may not be as large, these fires are as effective and possibly more effective in some cases at achieving your objectives. A flanking fire is a line of fire parallel to the wind direction. To top-kill an unwanted shrub, for instance, the entire circumference of the shrub stem must heat to 145 degrees F—cooler than boiling water. Top-killing shrubs is best accomplished with a slow backing fire in areas where combustible grasses or leaves are touching the shrub stems. Flanking fire is a line of fire parallel to the wind direction. The amount of fuel consumed, the fire’s duration, and the temperature the fire reaches are in between what is achieved with a backing fire and a head fire. This type of fire is used by managers to move fire around a burn unit and into the direction of the wind. A head fire moves with the wind, which here is blowing from the right. Note the tall flames. Head fire is a line of fire that moves with the wind direction. Because it’s being pushed by the wind, head fire spreads quickly and has longer flames, making it the most dangerous type of fire. In a basic prescribed burn, head fire is lit only after backing and flanking fires have been used to secure the edges of the burn unit. When the three types of fires meet in the middle of the unit, the fire burns itself out. Burn breaks around the entire burn unit help to contain the fire by creating a break in burnable fuel along the edges. 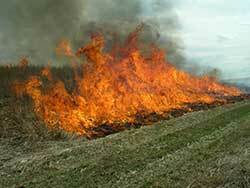 Typical burn breaks include roads, rivers, farm fields, a burned line, raked path, or other non-burnable surface. Breaks are installed prior to the burn and should be at least five feet wide.